2) Pour the macerated cherries into an 8×8 deep baking dish, a larger shallow dish, or multiple small baking dishes, whatever works. If the filling goes all the way to the top of the dish, place the dish on a baking sheet to prevent messy spills. 3) Cover the fruit loosely and evenly with the crumbled topping mixture. 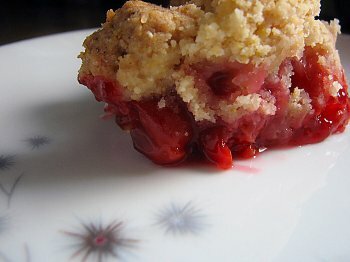 4) Bake until the crumble topping is spotted with brown and cherry juices bubble through, 35-45 minutes. 5) Cool the crumble until at least lukewarm to allow the fruit to set. This entry was posted in Baking, Fruit, Photos, Recipes, Sweets by Annie. Bookmark the permalink. This looks delicious and your food blog rules are hilarious. Hi, just wanted to give you kudos….loved the title (pure genius!) and the pics were delish! I’ll def. have to try this out! Have a great day! protected static: Good point. I’ll have to add an exception to the rules. Found your blog through Joelen’s. Never knew what to do with sour cherries so I never pick em up. Thanks for this recipe. Mosquitoes used to eat me alive too so I feel your pain! They usually leave me alone if I eat a lot of garlic in my food (old home remedy repellent), but not sure if that would work with other critters? THe cherry crumble looks amazing. I made apple and sultana crumble during the week, and I’m slightly ashamed to admit, ate most of it(over 3 day) while my husband was at work(I’m on holiday at the mo). As for the mosquitos, i can’t gauruntee it will work, but you could try tea tree oil. Most beasties hate it, and it works for midges and cleggs, the Scottish version of mosquitos. (except they are tiny and therefor harder to kill/avoid). I have just found you blog, and will more than likely spend the next 2 hours reading the rest of it! p.s. Excuse the typing mistakes. I can actually spell, honest! Jude: I hope you like it! Ari: I love having an excuse to eat more garlic. Even if it doesn’t work, I’ll be pretty happy, heh. Lisa-Marie: Welcome! You ate your crumble over only over 3 days? You have far more willpower than I do. I spent some time in a particularly mosquito-infested part of the world once, and I remember thinking that I had truly reached the seventh circle of hell when I looked down at my sandaled foot to see an obese mosquito sucking on a bite that I had gotten the day before. Since I got back from that trip, however, I seem to be a walking citronella stick. I’m not complaining. Also, I love the second picture! I’ve been following foodblog links around randomly for a few minutes, and the cherry photographs were the reason I stopped, and now your writing has me laughing as well. That crust on your crumble looks amazing. Jeff: Thank you so much, hope you stick around. I’m obviously a late-comer to this party, but wow, that’s a great looking dessert! 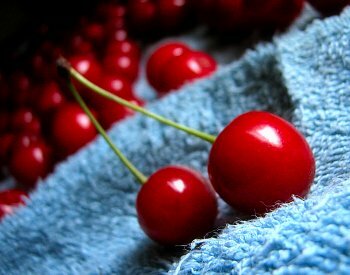 I’m wondering if regular sweet cherries could be used (or even some gorgeous Rainier cherries that are finally in season.) I’m thinking maybe I could reduce the sugar by about half? Any thoughts? Thanks again for the inspiration!